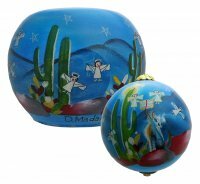 This 3" round ornament & 3" Votive are hand painted on the inside! No two are exactly the same. The painting process for each item takes three days to complete.